Who says that oil, wool—and sheep manure don’t mix? Most everyone has heard of the “Lucas Gusher,” which ushered in the great Spindletop Oil Field at Beaumont, Texas on January 10, 1901. The original field, however, peaked in 1902; and by 1924, annual production fell to less than 352,000 barrels. What has gone almost unnoticed is the fact that on November 14, 1925, a “Second Spindletop” strike occurred — one that would completely overshadow the first. A small, relatively unknown Yount–Lee Oil Company, led by Miles Frank Yount, used modern deep-drilling methods, exceeding depths of 3,550 feet, to gain access to the elusive Black Gold. The enterprise, which grew to be the largest independent in the United States in its day, rivaled industry giants such as the Texas Company (Texaco) and Gulf Oil. After Yount’s death in November 1933, however, the heirs and stockholders in less than two years sold the company assets to Stanolind, a division of Standard Oil, for a whopping $41 million, which then represented the third largest financial transaction in the country’s history. 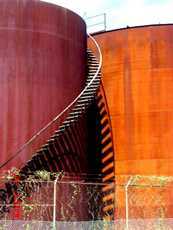 But during its heyday and with its oil storage tanks filled to the limit, Yount–Lee was ever concerned about the safety of its huge investment. The tank farm covered some 640 acres, and the presence of high grass and weeds created a fire hazard. In order to resolve the problem, sheep were brought in; and after a fairly short period, the herd increased to about 1,301 head. During one of Frank Yount’s inspection tours in August 1931, he pointed out to P. R. Mitchell, tank farm superintendent, that the corporate charter called for oil exploration—not the raising of sheep. Yount also noted that a large lamb crop of about 600 was anticipated. In a joking manner, Mitchell remarked to his boss, “Well, in the first place, they’re working for us, and in regard to the lambs, I can’t help what they [the adults] do after working hours.” The industrious Mitchell also mentioned that over 4,700 pounds of wool had been marketed at 9 ½ cents a pound, and that sheep manure was bringing $30 a ton. The enterprise provided 15 to 30 tons of manure each month.